Former Alaska Gov. Sarah Palin and Fox News host Sean Hannity blasted the Republican establishment for vilifying conservatives trying to keep their promises to constituents. The two reluctantly suggested that formation of a third party may be the only way to allow the voices of Americans who feel disenfranchised by the two-party system to be heard. 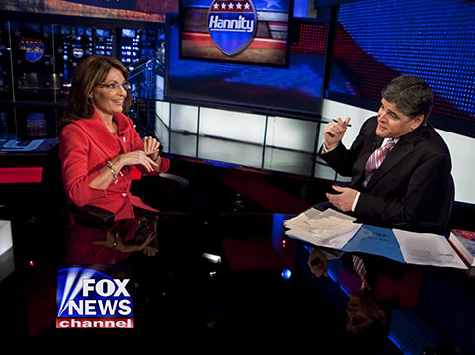 Palin appearied on Hannity’s radio show on Tuesday. On Monday, Hannity said that it may be time for a conservative third party, if the GOP continues to push fights down the road on vital matters like Obamacare. For her part, Palin has called Sens. Ted Cruz (R-TX) and Mike Lee (R-UT) leaders of a party of “good guys” in Congress. Palin told Hannity to “keep thinking along those lines” and mentioned that Hannity, like her husband and her closest friends and family, is not even a registered Republican. Echoing Hannity’s remarks, Palin also said that establishment Republicans want to fight on a “smaller hilltop” when the “mountain in front of us is financial catastrophe.” Palin said Obamacare has “much to do with” the country’s dire financial straits, and she said conservatives opposed to Obamacare are fighting against tyranny and for more control over healthcare.